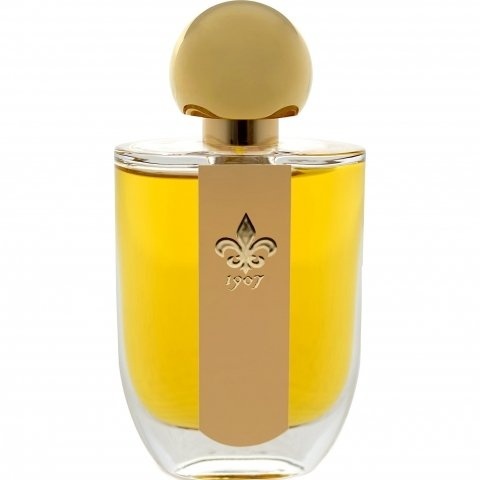 Mon âme is a new perfume by 1907 for women and men and was released in 2018. The scent is floral-creamy. The longevity is above-average. It is still in production. Due to the lack of a sure feeling for individual notes, the subjective impressions are in the foreground: "Mon Ame", "My soul", is an incredibly grounded and stable, resting, calming and soothing, almost meditative scent. Like his sister Genevieve, he conveys elegance and sovereignty. In his heart he is most likely to be described as flowery, but anything but from a sweet or harmless-cheerful young girl's floweriness, rather soft, soft (but also this scent densely woven again), discreet, distinguished, perhaps even knowledge-melancholic. The fragrance changes, but I can't describe a clear course (as I can hardly describe the individual notes anyway); after 2 to 3 hours I feel a hint of ambry freshness, after four hours a more lively lavender freshness, then again a floral creaminess, after eight hours spicy and woody impressions and - I'm quite sure of that - clay candies. In this final phase, "Mon Ame" is more of a men's fragrance. Even before, it is certainly wearable for men, at least that's what I think (I have reason to doubt whether the ladies around me see it the same way). However, perhaps rather for the gentleman with a refined way of life; to a youthful and metaphysical free nature boy he fits at most like a fist to the eye. One final word on the fragrance: I feel the fragrance to be rather cool thermally and yet, I myself don't know how it goes together, occasionally as from a sluggish, almost sultry sensuality. A final word on both Genevieve and Mon Ame: Voilà, after the great Czech brands Astrid and Alpa (drugstore shelves, cheap, shaving lotions and colognes, old company stories), I have now found a favourite with my little Slovak sister (niche, exclusive distribution channels, EdPs, expensive, new foundation made a bit old). They've got it olfactory thick as a fist behind their ears, the Western Slavs. Does anyone have any tips for Polish fragrances? The beauty of things lives in the soul of whoever looks at them. From my point of view, "Mon âme" did not spare beauty, even though I discovered it bit by bit. A scent of iris that doesn't take me by surprise, but that slowly binds me to itself. Only after repeated wearing does the perfume for me not only consist of the iris and sandalwood. My attention is increasingly drawn to the softer notes, which only appear after hours and make the composition appear much softer. The already often slightly woody scented iris is reinforced by the sandalwood and the citrus notes and the Davana do not peel out so clearly in the opening, but let "Mon âme" appear friendly and light. This impression of a small stubborn wooden donkey in the middle of an iris bed stretches over a long time and in a touch of impatience I once again question my sense of smell, because on my wrist I can recognize ahead of time lily of the valley, jasmine, some patchouli and the tonka bean with its discreet almond scent. It would be even nicer if a perfume would surrender to the dictates of time, and so it lets me stew between light iris and woods for hours, until sometime around the wooden donkey the iris bed turns into a flowering meadow and the flower cups add their interwoven scent to that of the iris and the sandalwood. Undoubtedly the foreplay of the perfume for hours has its charm. The minimalist duet of iris and sandalwood is beautiful, but seems serious to me, a bit stubborn and at some point monotonous. In my opinion "Mon âme" develops its full splendour by the addition of the floral notes and the base. In its complete appearance I find this fragrance soft, varied and extremely winning. Write the first Review for Mon âme!